After reading Edward Hardy's debut novel, Keeper and Kid, I turned the book over to read the blurbs on the back cover. Not surprisingly, Stewart O'Nan wrote of the book, "Even in his most trying moments Keeper is nimble and affecting, a tribute to the author’s endless comic inventiveness." Moving, funny, and incredibly true to life, I alternately laughed and blinked (when my eyes glazed over just a bit) as I read this novel. Hardy's characters are people we know, and their complex interactions (even the three year-old's) always ring true and create an unforgettable story. 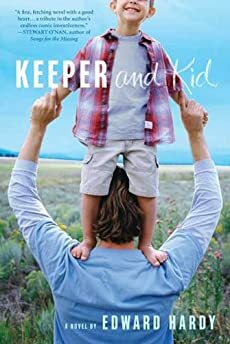 Keeper and Kid is the story of what happens when James Keeper, very happily living his antiques dealer/salvage yard life in Providence, learns that his ex-wife Cynthia has died and that he is the father of a three-year, a son he didn't know he had. As you can guess chaos ensues. The novel took almost four years to write and there was a lot of music consumed along the route, so it's tricky to pinpoint exact songs that had an influence. I actually have a hard time these days writing with music on, but with this book I did go through a stage of listening to Sun Kil Moon's "Ghosts of the Great Highway" over and over, especially while writing, until one day the compulsion stopped as mysteriously as it began. Anyway, here's a playlist. A lot of these songs were either floating through my head as the novel came together or ones I imagined the characters might latch onto as certain events come to pass. There's a morning radio show in Rhode Island on WRIU, "Hard Boiled Jazz," where they play tons of rhythm and blues and you get to hear singers Big Maybelle. It's the kind of show Keeper would no doubt use as a crutch to ease past his second cup of coffee and deeper into the day. Every time I hear this song I always I see David Byrne in the movie "Stop Making Sense" doing that dance with the floor lamp. When the novel starts Keeper and his girlfriend Leah have just moved into a tiny, 150 year old house, just south of Providence. This always feels like a good song to hear in the kitchen, any kitchen. Leah is from upstate New York and likes accordions, in all situations, which could easily make her a fan of Donna the Buffalo. His lyrics always knock me out and I'm sure if Keeper heard this there'd be a faint, rueful smile of recognition. I also love that line: And we can't grow up/ because we're too old now. Tim is Keeper's middle school friend and business partner and a serious Radiohead fan. Keeper puts on this on as they're heading up to Boston in the van to pick up Leo, Keeper's newly discovered son, and all of Leo's gear. I've always liked the layers in this song, the way it's driving and wistful, all at once. This song has a great bass line and I love the dark way it swoops. When Keeper falls off the rails, right after Leo's arrival, he ends up listening to a lot of Cowboy Junkies. I heard this on public radio one morning and it lodged itself in my head for days and days. It's completely ethereal and graceful and feels like a song Keeper might stumble across after Cynthia's death and then carry around for quite a while. The ache in this gets me every time and I love the way the organ winds it's way behind and then in front of the piano line. When I was writing the part of the book where Leah decides she can't handle life with a three year-old and leaves and won't call Keeper back, this song kept popping into my head. There's something about the guitar line in this song that's determined, a little sad and finally hopeful that I've always liked. It seems like a song that might resonate for Keeper towards the end of the book when he and Leo have started to negotiate the new shape of the future.